Last night’s accommodation in Cesky Budejovice was remarkable for the fact that the wardrobe had been converted into the bathroom. They are very clever in finding ways to fit bathrooms into European penzions. Tonight’s penzion in Tabor is an enormous suite by comparison. Today has been hot and sunny. We had coffee in the namesti (square), admired the Samson fountain on top of which Samson wrestles a lion while being pounded with water. There is the Erratic Boulder in the square too, hard to find as it’s only slightly larger than the paving stones. There’s a story to that involving 15th century gallows and other gruesome stuff. 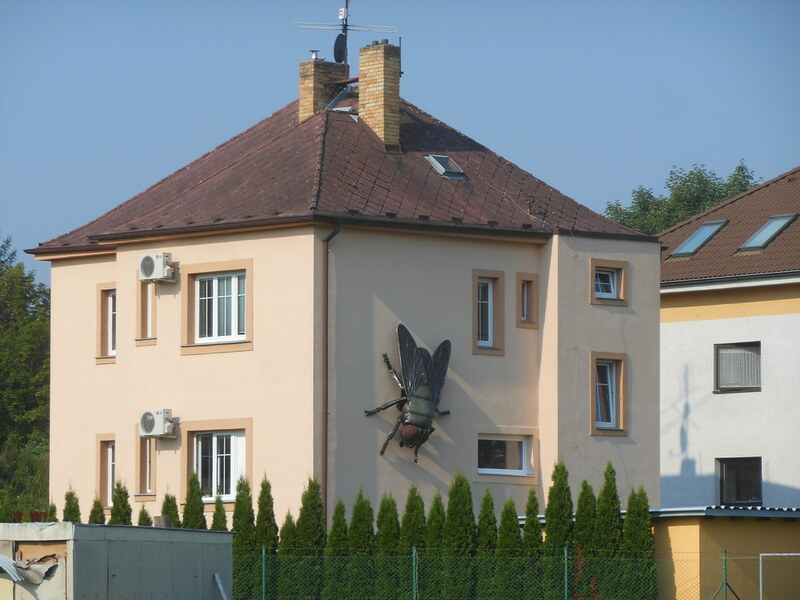 I found a house adorned with a giant fly – this gets Most Unusual Feature prize for today. We have really finished our cycling tour now and are travelling by train in the direction of Prague. During today’s train leg I was doing a little ukulele practice. This caught the attention of Eva whose daughter has a ukulele but doesn’t know how to play it. A 5 minute lesson got her going with two chords and a simple strum! We have come to Tabor, another interesting and beautiful historical town with lots to see and a low to medium tourist density. 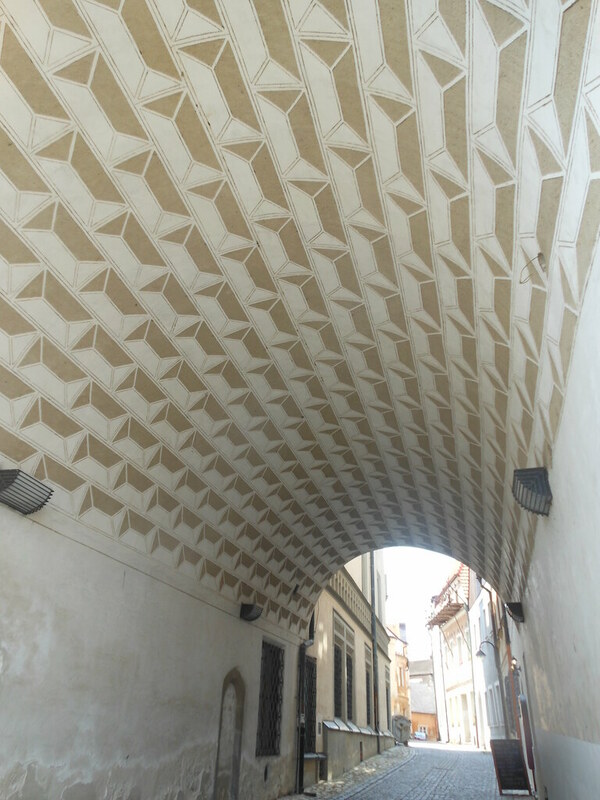 I am converted to the wonders of sgraffito decorations on buildings and plan to introduce them to Royston Park. We wanted to watch the Olympic Games opening ceremony, especially after we heard about Boris going zoink, but the TV reception is poor. I thought I’d drop in to the non-stop sports bar up the street and catch it there, but they, and apparently everyone else here, prefer the regular Czech television programs. More clunk than zoink in Tabor! This entry was posted on 27 July 2012 at 8:01 pm and is filed under Czech Republic. You can follow any responses to this entry through the RSS 2.0 feed. You can leave a response, or trackback from your own site.